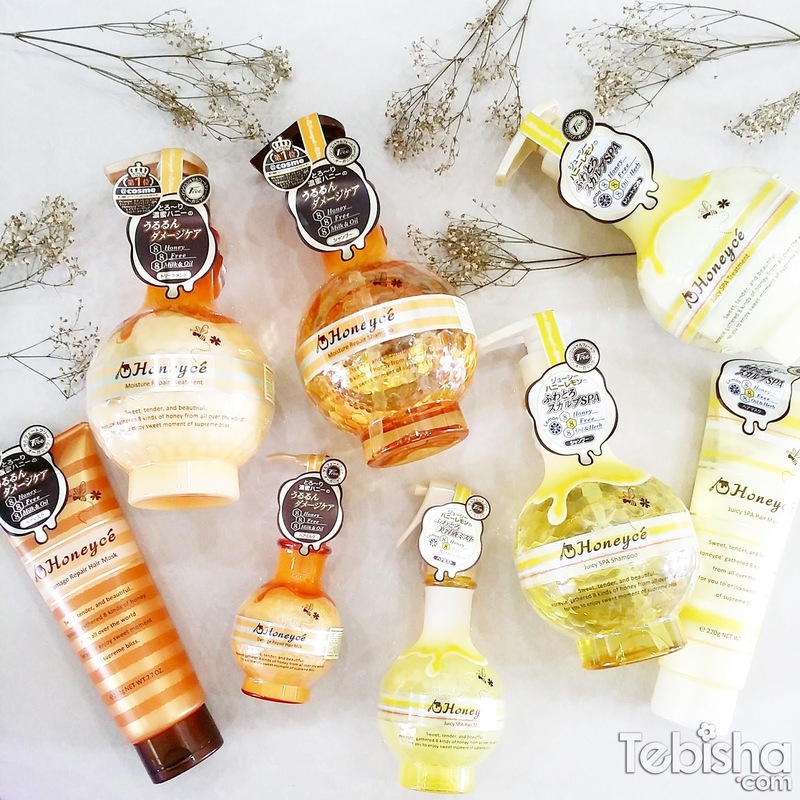 MoltoBene never fail to surprise me with their haircare range. Previously, I had reviewed Bene Premium Bluria and Rougeria Shampoos and Treatments it works amazing on my badly damaged hair. The kind people from MoltoBene had sent me Honeyce Moisture Repair Series and Juicy Spa Series haircare products while I was in Perth in early May 15. I was overwhelmed when I opened the package, their generosity surprised me. Honeyce Moisture Repair Series and Juicy Spa Series, Shampoos, Treatments, Hair Masks, Hair Milk and Hair Mist! I’m going to review Honeyce Moisture Repair Series in this post, recently I have rebonded and permed my hair, the double chemical hair service has caused my hair to be dry and unmanageable. Will be showing my before and after hair condition in this post so read on. Rich, weightless honey lather of this silicone-free shampoo helps thoroughly cleanse and deeply moisturise hair. Directions: Apply an appropriate amount of shampoo to wet hair. Work into lather and massage from scalp to hair ends. Rinse thoroughly with warm water. Rich and weightless silicone-free creamy honey treatment nourishes hair from within, leaving it smooth and strong from roots to tips. Directions: After cleansing with shampoo, apply appropriate amount of treatment to wet hair then massage gently from hair ends. Rinse thoroughly with warm water. To have the best results, I used Honeyce Damage Repair Hair Mask after washing off the Honeyce Moisture Repair Treatment. Lush, velvety hair mask enriched with honey penetrates hair shaft for a deep moisture boost, leaving it strong and silky. Directions: After cleansing with shampoo and treatment, apply an appropriate amount of Hair Mask to the middle and end of hair. For optimal results, massage thoroughly with warm water after 3-5 minutes. Recommended to use 2-3 times per week. 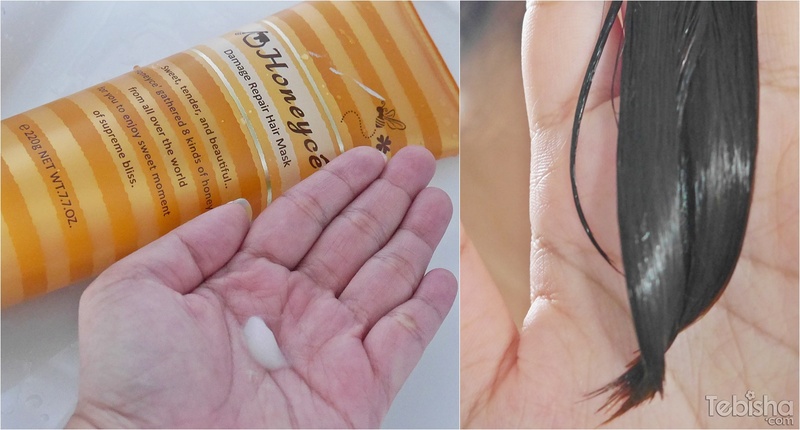 And lastly, after washing my hair I applied Honeyce Moisture Repair Hair Milk. Rinse-free damage repair hair milk specially formulated to nourish dry, damaged hair, leaving it strong and supple. Directions: 3 pumps of Hair Milk to the palm and apply it to dry or half-wet hair. This is my favourite product from the Honeyce Moisture Repair Series. 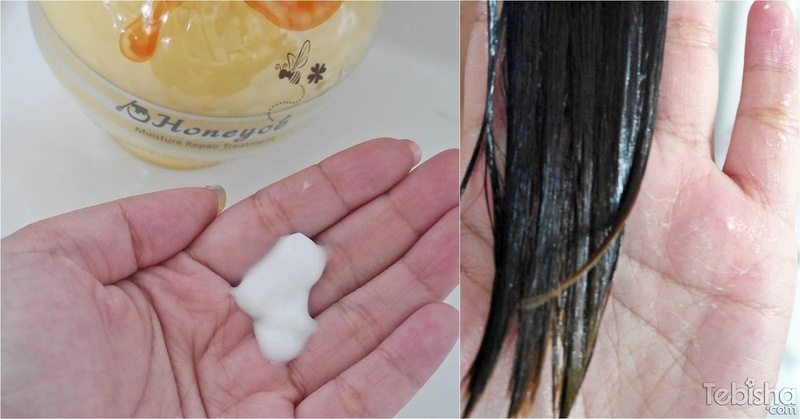 I uses the hair milk before blowing dry my hair and it gives me smooth and healthy-looking hair! Can you see the big difference? Honeyce Moisture Repair Series is the lifesaver for my chemically treated dry hair. All the products of Honey Moisture Repair Series comes with sweet fragrance of berries and honey, make the hair smells good and delicious. Why I love Honeyce Hair Care? Honeyce uses 8-Harm-Free Formula to protect us from hair and scalp irritation and gives us healthy hair conditions. If you are looking for products more for scalp care, Juicy Spa Series will be ideal! Honeyce Moisture Repair Series and Juicy Spa Series are made exclusively available in selected Watsons outlets nationwide!